The last two evenings, while walking home from work, I have been taking a left turn just past the jetty and walking out onto the ice over the lake. 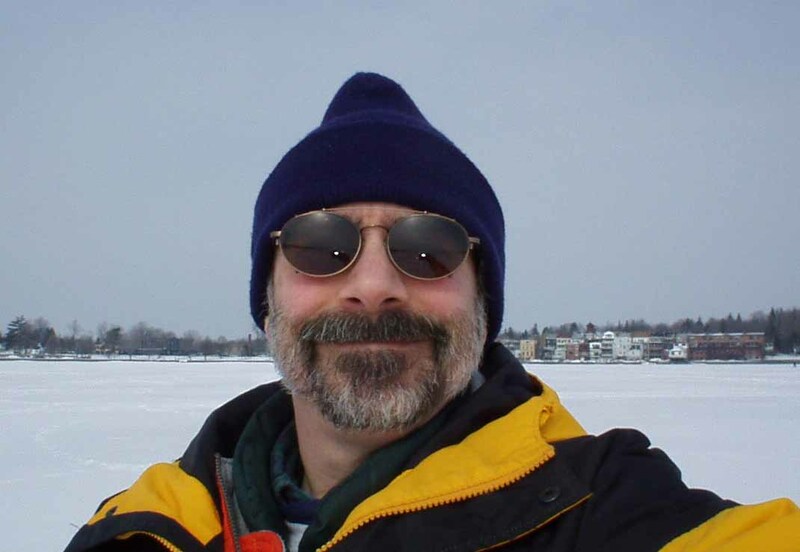 We have had a very cold winter in Skaneateles, and the ice is solid out into the deep water, out past the Country Club. In fact, one of my co-workers informed me that a gentleman he knows on East Lake Road walked across the lake yesterday to the Country Club. Wednesday was a clear, sunny day, perfect for a stroll. At sunset, I was on the lake when suddenly every raised ridge of snow turned from white to gold in an instant. There were fishermen sharing the ice, and people walking their dogs. The dogs, who live in the present far better than we can manage, showed no evidence of wonderment over where this vast open field has come from, in place of the water they know in the summer. I felt thoroughly alive, even daring, while walking on the ice, but a young woman nearby was actually running with her dog. And after, when I stopped at the liquor store for a celebratory bottle of wine, my favorite clerk informed me that people had been snowmobiling on the ice in the afternoon. And today, a ski plane landed on the ice, sat for a bit during the lunch hour, and took off again, raising the ante even higher. I’m not sure what nature of craft to expect tomorrow. These walks on the frozen lake have reminded me of two incidents from the past that I read about months ago, on a hot summer afternoon at the Historical Society. On January 16, 1917, one Howard B. Smith, 21 years old and known locally as “Bish,” drove onto the ice in a “specially constructed auto sled” with runners up front instead of tires. Joining him in this winter lark was Hans Pries, 26, of Auburn. The auto sled was successful in motoring across the ice, but it was not built to turn. As good ice turned to bad, Bish tried to steer but only skidded, farther and farther out, until he crashed through into the lake, where he and Hans drowned. Some 18 years later, Linden J. Clark, son of Mr. & Mrs. Jay Clark of East Lake Road, had a better trip. The Skaneateles Press reported that on Lincoln’s Birthday, 1935, the young man skated the length of Skaneateles Lake, and back again. His round-trip of some 32 miles took more than five hours. He had to skate around cracks in the ice near Spafford, and crawl in places where the ice had buckled. But he lived to celebrate his accomplishment. Perhaps it is his spirit I feel, when I turn on the ice and look back at the Village, the buildings suddenly tiny, and my knees begin to tremble even as my smile grows wider. A number of people have expressed concern lest I fall through the ice. I want you to know that I do have rules. I only walk on the ice when other people are already on the lake. And none of the people on the lake can be engaged in rescue efforts. I do follow the beaten path, since I don’t want to step into yesterday’s fishing hole. And I only walk on paths that have footprints going in both directions. I hope this offers some assurance. On Thursday, I wondered what manner of craft might be next out on the lake. Today, Saturday, I found, parked at the curb by the boat ramp, a creation that was half snowmobile, half swamp buggy, runners fore and aft, a snowmobile’s snout and a small airplane engine mounted on the back with a wooden prop. On its cowling, painted in black, the word “Experimental.” Oh yeah. Today I walked until I was all alone, past the Finch Boathouse, past Roosevelt Hall, almost to the Country Club, plumb in the middle of the lake. Footsteps went farther, but I felt like I was on the edge of the world. It was glorious. And Tom Flemming adds, “After having so much fun reading about your ice-capades, I thought you might like to hear about ours. After a long cold winter, we finally made it down to camp on the 8th. As we (Amy & I) drove through Skaneateles, we debated about the best way to get in – drive in as far as we could on the unplowed dirt road and walk in, or go to the marina and see if it would be possible to skirt along the shoreline. As we drove down along 41A, it looked as if the lake was frozen even down at our end. We didn’t think that was possible as we’d always believed (been told?) that the lake didn’t freeze at our end because it was spring-fed and too choppy. When we got to the marina, we found out that those tales were untrue, as a solid sheet of ice covered the lake. (I assumed it went all the way across though we didn’t test it!) We were easily able to walk the half mile or so along the ice to get to our camp and spent a nice day there. Photo above of Kihm on the ice, with the Village of Skaneateles in the background, by Kihm. You should try walking on lake at about midnight when quite cold and no wind. It is even better is you get a bright moon. I do this alone and take my camera and always up middle.. The sounds that you hear echo across the lake,otherwise very quiet. I usually go as far as Club following trail of fishermen. One moonless night I was walking along looking back at village lights when I ran into a fisherman walking toward village with his head down. Really scared the both of us. Never saw or heard the other coming. The rare black ice condition is something to really enjoy. I have skated up the middle as far as Lourdes and got tired at that point. On way back there was a south wind so I opened my coat as a sail which made trip back real easy. I don’t like going close to shore as moving water from creeks make it dangerous. Few years ago there was black ice up to Barney’s point (mile point] with a strong north wind. I went home and got a golf ball and 7 iron ,went back to park and made a snow tee for ball . First ball I hit straight all year. Followed it as it went off end of ice now I tell people I hit a 7 iron about 1700 yards. Let them try and guess how. Guinness Book of Records ?